Sony continues to expand its popular SRG PTZ Camera line up with the introduction of the SRG-300SE (black) and SRG-300SE/W (white) 3G-SDI and Live IP Streaming cameras. The SRG-300SE builds on the SRG-300H’s full HD (1080/60p) imaging, pace-setting 30x optical zoom and offers 3G-SDI interface for long distance, single cable transmission of 1080/60p 4:2:2 broadcast qualtity baseband digital video. The new SRG-300SE can simultaneously output 3G-SDI and live IP streaming content. The new camera features 30x optical zoom plus 12x digital zoom with a 65-degree viewing angle to produce H.264 IP video streaming with selectable bit rates. It can also simultaneously output 1920 x 1080/60p video over a single BNC cable through 3G-SDI that can run approximately 70m or more, easing installation and adding more flexibility to customer’s live production needs. It also features an expanded menu of pre-set options from 16 up to 256 and can be operated either by VISCA™ serial control or through an IP-based computer interface capable of remote operation. Audiences in overflow rooms to remote venues can monitor the event live and control and pan/tilt/zoom functions of the camera over IP. This enhanced learning experiences for interns at teaching hospitals and lets sports viewers feel like they are at the stadium. 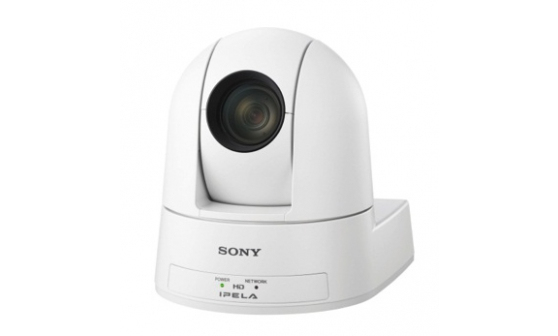 Designed primarily for small to mid-sized vensues, these new cameras are ideal for a single source PTZ camera with Sony’ renowned high picture quality and reliability at an affordable price. The SRG-300SE is certified to WORK WITH WOWZA Media Systems for simple and effective integration via Wowza Streaming Engine™ server software.